Widecombe famous for its fair held on the second Tuesday in September. Uncle Tom Cobley, Tom Pearce and grey mare and all. In the heart of the Moor and so popular with tourists on a Devon Holiday. On the village green one might if you are lucky, in early morning or late evening, see ponies. Several gift shops, cafes, serving yet more cream teas and a couple of inns. Admire the National Trust's Church House fine two-storey granite building dating from c.1540. The Trust have a shop and Dartmoor Information Point in Sexton's Cottage. Dominating the village is the Church of St. Pancras, dating from the 15th century. The church is widely known as the Cathedral of the Moors, due to its high tower. The Old Inn dating from the 14th century, with many original features, and renown for good food. Widecombe Around and about. Steps Bridge famous for its springtime display of daffodils, and oak woodlands walks alongside the river. Great walks along the River Bovey in the National Trust's Parke Estate too. 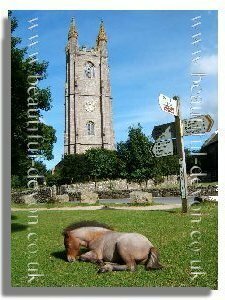 Right off the cover of a Devon tourist brochure Dunsford with its thatched cottages and village church. Dunsford Nature Reserve, keep to the paths to avoid crushing the daffodils. Ensure the display is here for future generations to enjoy. Dartmeet where the East and West Dart rivers meet, crossed by an old clapper bridge. Badger's Holt a popular Sunday afternoon drive destination with a picnic by the river, or a Devonshire cream tea in the adjacent tea rooms.